chronic pain | Troy C. Wagstaff aka CallahanWriter Blog: Topics of interest include Western Historical (1865-1899) Topics. Additionally inspirational Christian and Fibromyalgia interests. The movie “Cake” starring Jennifer Anniston. It is billed as a movie about Clare Bennett, who deals with the suicide of a member of her chronic pain support group. Here is the advertising blurb about the movie. Jennifer plays a woman afflicted with chronic pain due to injuries and metal rods in her legs, the story is not clear about the accident that claimed the son and severely injured her. She is supposed to be a “hilarious” character. I did not detect that in her character at all. I did detect some sarcasm in some of her dialog. The biggest problem with this movie is that we have no idea who Claire was before the accident and resulting chronic pain and drugs. We don’t know what aspects of her personality and behavior are affected by her chronic pain and narcotic use. Both chronic pain and chronic narcotic use can have an effect on one’s personality and behavior. Not knowing what she was like before, seriously hinders us from knowing the roll of the pain pills. One view of the movie and most are left thinking that people with chronic pain are addicted to pain pills. That is not at all true and the movie does a grave disservice to those of us who have chronic pain. There is a lot of evidence of her being addicted to pain killers and the fact that she had hidden stashes of narcotics around the house suggests that she is addicted. But if they want to address the issues of chronic pain they need to also address the role that pain killers play in pain management. They don’t. There were some interesting aspects of this movie as Jennifer Anniston played a pain ridden Claire such as her laying down flat whenever she was in a vehicle. Her character had a hard time standing up and sitting down. She used her swimming pool for relaxation. She had trouble sleeping. She moaned when making certain movements, but if I was the consultant to the movie she would have moaned a lot more when rolling over from her back to her side in bed or when standing up from a seated position. It also showed this chronic pain patient as having a bad attitude and angry. I can relate to that. We’re not always ornery and angry, but we all have our moments. I would like to see a similar movie about someone who suffers from chronic pain who doesn’t have the financial benefits she did. Show us a person with chronic pain and fatigue with limited financial resources. That would make for a good movie, depressing but realistic. The movie showed that Claire, the one with chronic pain, still had an interest in physical intimacy. Being a man, I can’t speak to that, but I look at it dubiously. This isn’t a theatrical review of the movie, I am reviewing the movie and its storyline from the perspective of someone who has had chronic pain for more than eleven years and fibromyalgia for more than thirty years. 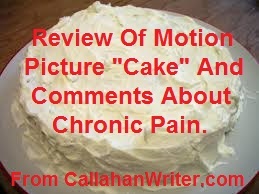 Overall, this movie “Cake” is not a great movie to represent chronic pain. But it is a start. Chronic pain is prevalent in our society that it is bound to come up more and more in our cinema. Hopefully they will do a better, more responsible job in the future. Chronic pain is very real and very difficult to deal with, both from the patient’s perspective and from the care givers perspective. This movie is rated R and not family friendly. One last thought to anyone who might read this and not understand the effects of chronic pain, everyone who has chronic pain responds differently.